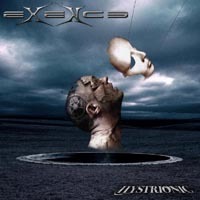 Are Exence (formerly Essence) members good musicians? Excellent, no doubt about it. Do they, as I do, worship Chuck Schuldiner’s work? Absolutely,especially “Symbolic” and “The Sound of Perseverance”. Massimiliano Pasciuto just sings/screams as Chuck did at this time. Have they foundthe perfect balance between this influence and their own personality, as Obscura did with the great “Cosmogenesis”? Actually, no. It seems thatExence almost wants to be a kind of Death tribute band, in purpose, as aside project. The Toscanian quatuor shows strength and melodic sense, plays incisive riffs spiced with virtuoso solos and inspired bass playing. Songs like “When Words Are Loose”, “Fix from the Ground” or “Primal Mystic Substance“ are a real success. Instead of a simple cover, “Symbolic Act” is an interesting medley of “Symbolic” and “Flesh & the Power It Holds”, combined with the band’s tribute to Chuck. The enthusiasm is tempered here and there because of parts with a slight lack of imagination and ambition, not bad, but not good enough for the prestigious legacy the band claims. That is why I humbly give only a very good character, not a top one. But when I listen to a band which has Death as a clear source of inspiration, I have to admit I become suddenly very sensitive and hard to please.